Near the capital city of Boise, in the foothills north of town, lies Bogus Basin Mountain Resort. Only 16 miles north of downtown, Bogus is a convenient resort for visitors and locals alike. With 2600 acres of skiable, snowboardable terrain, there is fun to be had by all ages and skill levels. Fortunately, the fun at Bogus Basin doesn't end when the sun goes down. Bogus has more night skiing terrain, 165 acres, than any other ski area in the northwestern U.S. Which means no matter what your schedule, the lifts at Bogus Basin will most likely be waiting to assist you in making some tracks. The resort also offers two downhill lodges plus one Nordic lodge, equipment rentals, cafeterias, lounges, ski school, and day care. 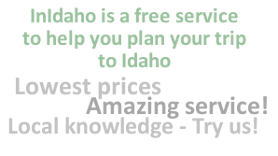 Ski Packages are available through InIdaho.com which means your next business trip to Boise just got a lot better! Turn left on Hayes (heading west again). Follow Hayes around a sharp right-hand corner where it becomes Harrison Boulevard heading north Follow 1 mile as Harrison crosses over Hill Road and Harrison becomes Bogus Basin Road. Continue 16 miles up Bogus Basin Road (heading North) to the Bogus Creek Lodge parking lot. We do not have any current pre-built packages for Bogus Basin . Located in the J.R. Simplot Lodge (lower level), the child care center at Bogus Basin Mountain provides a safe, fun atmosphere for children ages 10 months to 5 years old. Qualified staff members who are trained in CPR and First Aid are always present. All child care employees have passed ISP background checks. The Bogus Basin Nordic Center is located 1/2 mile past the Bogus Creek Lodge. You will see the Nordic parking area as well as the new Frontier Point Nordic Lodge and Trail head. The Nordic Center is open 7 days a week, 10am to 4:30 pm; 9am to 4:30 pm weekends and holidays. The facility boasts 32 kilometers of groomed and skate track skiing as well as the new Frontier Point Nordic Lodge. There you will find more information on Nordic ski school and race programs for skiers ages 5 and up. There are daily group lessons for all ages and abilities in both classic and skate techniques. Call the Nordic Center for complete information at 332-5390. The Nordic Center also has tickets, limited food service, as well as ski and snowshoe rentals. Skiing and boarding is for all ages, and Bogus Basin is the best place to learn! Our professional instructors teach you the basic skills or improve your skiing/ boarding to a level where you can master the mountain. Whether you are age 3 or 53, our instructors can make sure you have the skills to have more fun on the slopes. Bogus Basin, the mountain, is set up perfectly to help skiers and boarders of all levels feel right at home. Beginners will feel comfortable on the Coach Lift and "Coach's Corner." Intermediates can easily handle the different terrain and conditions on the front and back sides. Visit our office at the Bogus Creek Lodge (located at the lower level) or call us at 332-5340 to become a better skier and have more fun! Lift Ticket Hours: Bogus Basin full day/night lift tickets are valid from 10 am to 10 pm (MST). Half day/night lift tickets are valid from 1 pm to 10 pm (MST). The Night only lift tickets are good for the hours of 4 pm to 10 pm (MST). Multi-Day tickets are available: Buy 3 or more consecutive days, get $10 off each full day/night ticket. No other discounts can apply. Mountain must be in full operation. Visa, MasterCard, Discover, Traveler's Checks, Bogus Basin Gift cards and Cash accepted (Do not accept AmEx). Season: Usually mid-November to mid-April depending on snow conditions. Monday - Friday Lift Hours: 10:00 am to 10:00 pm (MST) Saturday & Sunday/Holiday Lift Hours: 9:00 am to 10:00 pm (MST) Please note: On-mountain hours change in the late season, normally at the end of March, please call the Bogus Snow Phone at 208-342-2100 for updated hours of operation in the late season. From Interstate 84: (approx. 20 miles) Eastbound I-84: take City Center Exit Westbound I-84: take Franklin Road Exit #44 1. Follow I-84 to the River Street Exit 2. Turn left on 15th (heading north) 3. Turn left on Hayes (heading west again). 4. Follow Hayes around a sharp right-hand corner where it becomes Harrison Boulevard heading north 5. Follow for 1 mile as Harrison crosses over Hill Road and Harrison becomes Bogus Basin Road. 6. Continue 16 miles up Bogus Basin Road (heading North) to the Bogus Creek Lodge parking lot. Please note: Guest reviews may mention certain amenities that may no longer be offered with Bogus Basin. Please check the amenities prior to booking to confirm. "The mountain is a 45 minute drive up a very windy road, but it's right at the foothills of Boise so it's a great location. The snow was great, the lifts were plentiful, and everyone at the lodge was very helpful and friendly. A great mountain for snowboarding!" "In Idaho for the Special Olympics .Enjoyed our stay and would like to Thank Bogus Basin for their support."